The Maternal Mental Health: A learning Programme for Midwives, has been designed by the All-Wales Perinatal Mental Health Group led by a team of experts from Cardiff University’s Schools of Medicine, Nursing and Midwifery and produced by Healthcare Learning Company, Smile-On, with funding from the Welsh Government. Central to the new learning module is the key message that all healthcare professionals involved in antenatal and postnatal care should ask key questions to help predict, as well as detect, those women at risk of severe mental illness during pregnancy and childbirth. “Some years ago the World Health Organisation proposed that there is no health without mental health,” said Dr Ian Jones, Reader in Perinatal Psychiatry at Cardiff University and Chair of APP, who led the development of the training module. Suicide is a leading cause of maternal death in the UK and it is vital that women at high risk of severe mental illness at this time are identified so that appropriate help can be given to help keep them well. The Mental health and well-being of women in pregnancy is pivotal to ensuring good clinical, social and psychological outcomes for both mother and baby and provide a healthy start to family life. “In view of this, it is essential that mental health is a central component of midwifery care – which is the primary motivation in developing this new on-line learning tool,” he added. The module covers a variety of different subject areas including: commonly held beliefs about mental health and pregnancy; characteristics of those women most at risk of severe mental illness; help for health care professionals to ask questions about a person’s mental health in the right way and then how to interpret the answers; and when to refer women for more help. 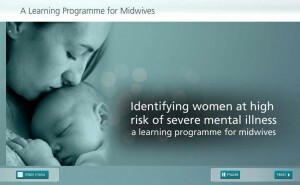 By developing this new learning programme our aim is to provide the essentials that midwives and, indeed, all healthcare professionals need to identify those women at risk of severe mental illness in the postnatal period, according to Grace Thomas from Cardiff University’s School of Nursing and Midwifery and Consultant Midwife at the Aneurin Bevan Health Board. By providing these essential skills we hope to ensure that women will receive timely advice, referral and treatment and access to skilled appropriate care. The new module available contains a series of on-line resources including videos and learning materials which can be accessed at any time, helping midwives and students to fit their training around their busy working day, as well as being a valuable resource in group and workshop education sessions.